The Dardanelles operation was of shorter duration and was an ill-fated attempt to support Russia by attacking Turkey, Germany’s ally. By the end of the 11 month campaign 410,000 British Empire and 79,000 French troops had passed through Gallipoli, of which 205,000 and 47,000 respectively had become casualties. For a campaign that lasted less than a year the death toll at Gallipoli was very high. Approximately 44,000 British, French, ANZAC and Indian troops were killed. Estimates of those killed from the Ottoman Empire range between 66,000 and 86,000. 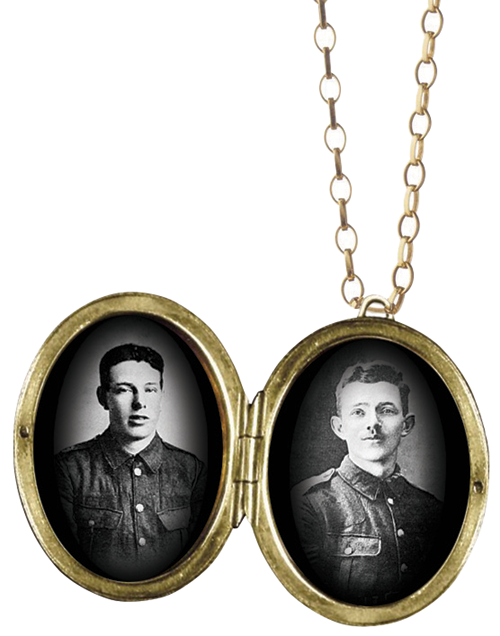 The Cottrell brothers, Harry (Henry) and Albert, died together at Gallipoli. They were both golf professionals from Guiseley. Their brother William died in 1918 whilst serving with the American forces. He was also a golf professional. In March 1915 the failure of the Royal Navy to neutralise the Turkish fortresses along the Dardanelles and thus clear the route to Constantinople (now Istanbul) portended later disasters on land. 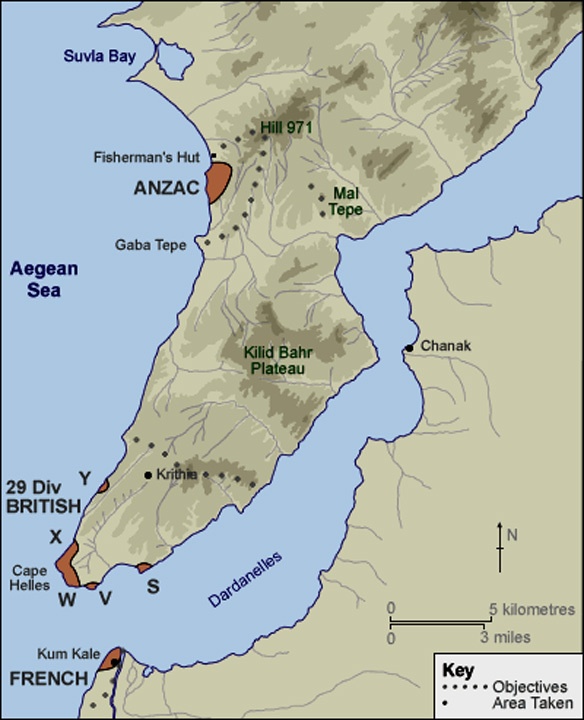 British, Indian, Australian, New Zealand and French troops were involved in the landings in April 1915 on five beaches round Cape Helles at the southern tip of the Gallipoli peninsula, and later at Suvla Bay and Anzac Cove on the western coast. Once inland, repeated frontal assaults in hilly, open terrain made negligible progress. 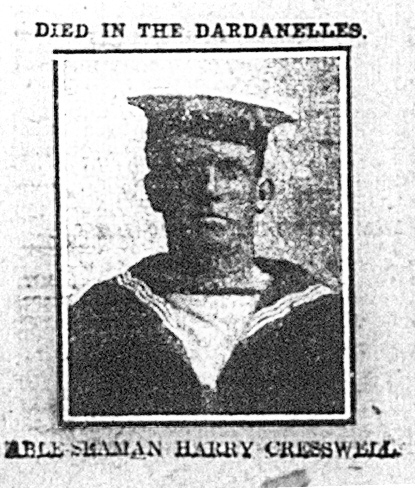 Harry Creswell, from Bowling Street Manningham, serving with the Drake Battalion of the Royal Naval Division took part in one of those attacks but was killed on 16th July 1915. The Turkish forces led by the German military advisor general Otto Liman von Sanders, were not so easily pushed aside. In August 1915 new efforts were made to achieve a break through. 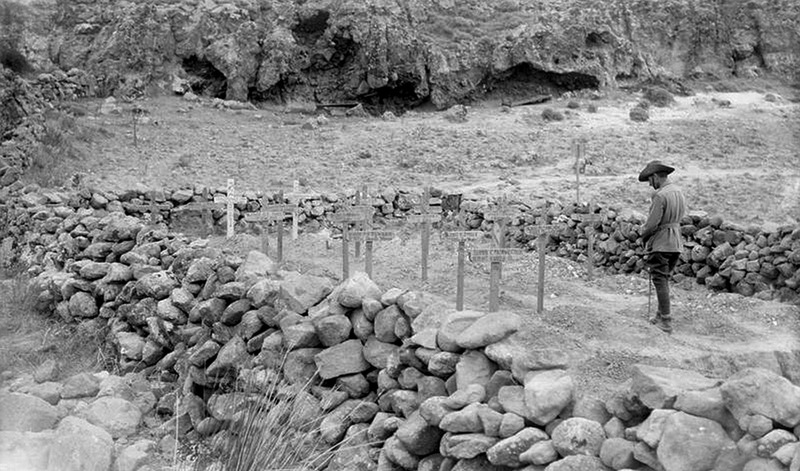 Albert and Harry Cottrell of Guiseley (9th Sherwood Foresters) were involved in a new landing at Suvla Bay on 7 – 8th August but were killed almost immediately. Harry Laws from Queensbury, Thomas Whitty from Waterford and sixty other members of the 7th Royal Dublin Fusiliers died on 16th August 1915 before the Battalion had to withdraw. 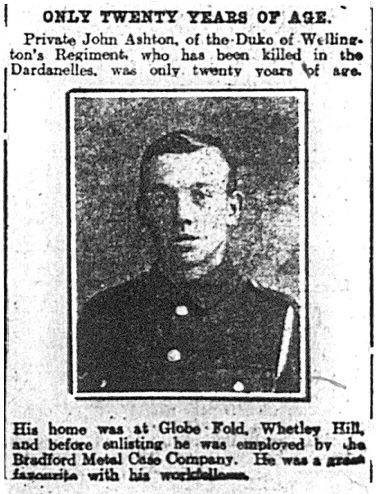 William Edmondson of Saplin Street, Bradford was in 9th West Yorks which relieved the Dublin Fusiliers on 13 August. 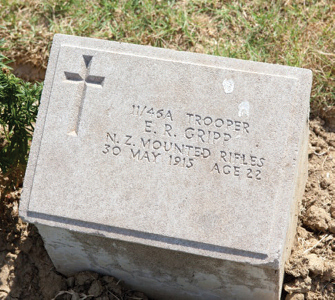 He was to die in October 1915 in Alexandria from wounds received at Gallipoli. The campaign was a total failure, militarily, but in the case of the Anzac forces its memory has become an all-important iconic element of Australian identity and helped define their sense of nationhood. 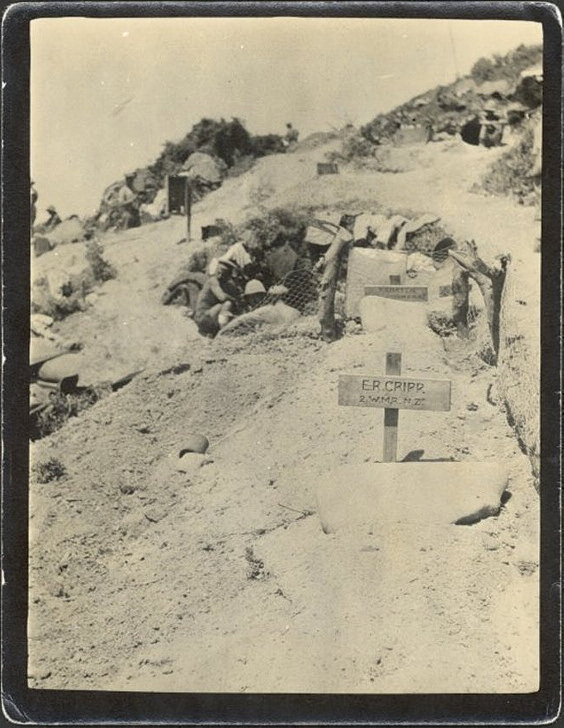 The temporary grave of Ernest R Gripp, Wellington Mounted Rifles, with another grave beyond and soldiers in a dugout beyond. Typical of the conditions for Anzac troops on the Gallipoli Peninsula where hardship and disease claimed many lives. 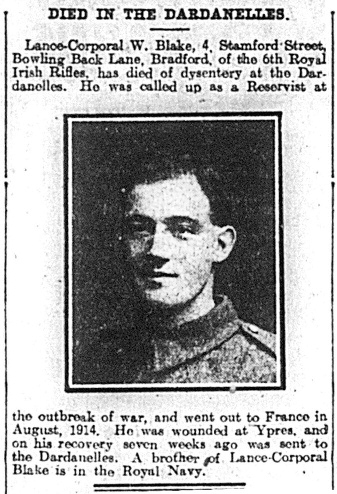 Ernest’s brother Hans was with him when he died, but Hans was to die of wounds 3 months later. Hans is buried on the island of Malta. Albert Victor Wolf’s family lived at 65 Sunbridge Road, Bradford. His German-born father Rudolph was a cigar manufacturer and two of Albert’s brothers joined the business. 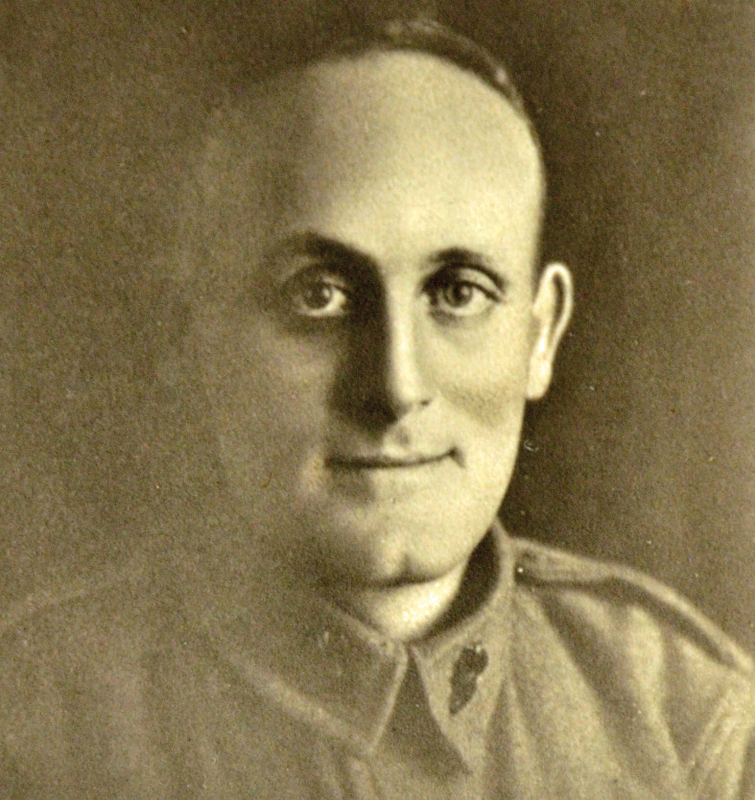 Albert was in Sydney, NSW when war began and served with the Australian Infantry. On 17 July 1915 the war diary records “some shelling. One man had his skull fractured by a piece of shell whilst observing”. This was Albert Wolf. Australian and Indian troops together at Gallipoli.